You can easily support the Love4Gambia Campaign by running or walking with Team Love4Gambia at the Scotiabank Blue Nose Marathon! Blue Nose race weekend, May 16-18, 2014, features a variety of events for all fitness levels – from walkers to runners. From the 4.2km youth run to the 42.2km full marathon, there is something for everyone including a 5km, 10km and Half Marathon (21.1k) event. Check this site in early 2014 for sign-up details! Signing-up for the Love4Gambia Blue Nose Charity Team is easy! Step 2: Using your race registration number from Events Online or Running Room, register for Nova Scotia-Gambia Association’sTeam Love4Gambia online here. Our Team Name is “Love4Gambia” and our Team Captain is Mary Catherine Connolly. By joining NSGA’s team Love4Gambia, you are committing to raising $50 to help the NSGA create positive change for youth and communities across the Gambia. Your efforts will create the opportunity for youth to go to school, hold a job and create a better future for their children. 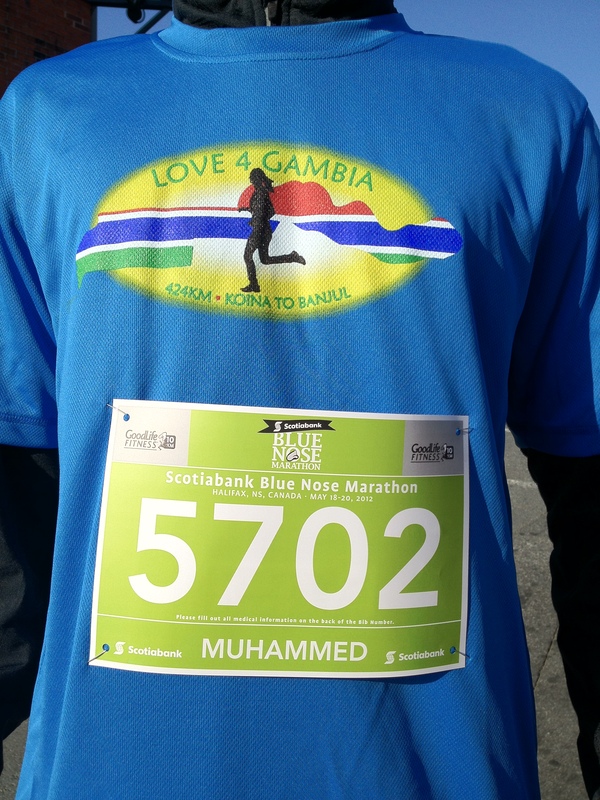 In 2011, our inaugural year, Team Love4Gambia, comprised of 92 runners and walkers, competed in Blue Nose Marathon weekend, raising a phenomenal $24,100 to support NSGA projects in The Gambia! The 2011 team was awarded a first place $3000 prize for being the team with the most participants. You can read more about Team Love4Gambia 2011’s race weekend experience here. In 2012, Team Love4Gambia boasted 53 members and raised $10,000! We were once again awarded the first place prize for team with most members.